The 20' wide sliding glass door pockets neatly away so there is little distinction between inside and outside. "you would never know that this house is on one of the main thoroughfares through town!" 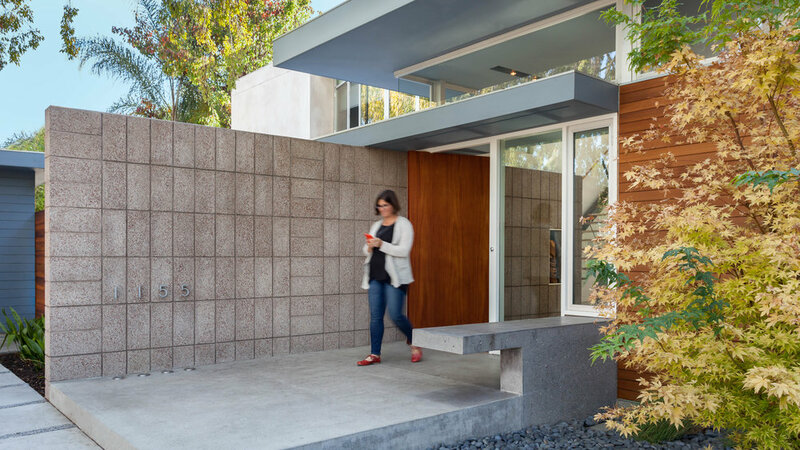 The warm cedar, polished concrete block and wide mahogany pivot door invite you in. Inside Outside living with materials extending from inside to out and a 20' pocket door that disappears. The clerestory windows provide privacy from the neighbors while providing light and air. The lower eave provides scale as it moves around the house. The entry bench extends from inside to out.